This mug had a worldwide release. 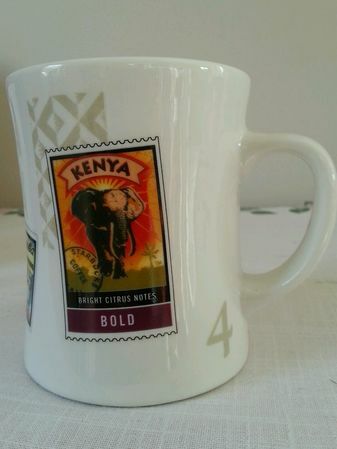 Kenya Blend. Added July 25, 2013: This is part of the 16 ounce Stamp Diner Mug series. It is a very attractive, heavy duty mug. On the interior is a graphic that looks like a postal rubber stamp that says "Starbucks Coffee Air Mail". On the exterior are (6) Starbucks coffee stamps from 2002. They are: Viennese Blend, Sulawesi, Ethiopia Sidamo, Espresso Roast, Columbia Narino Supremo and Kenya. It is called the Kenya version because the Kenya stamp is larger than the other five. There is a Starbuicks logo on the bottom, it says Starbucks Barista and it is dated 2002. I am interested in purchasing this mug in order to complete my Starbucks Stamps Diner Mugs Collection. Is this mug for sale?